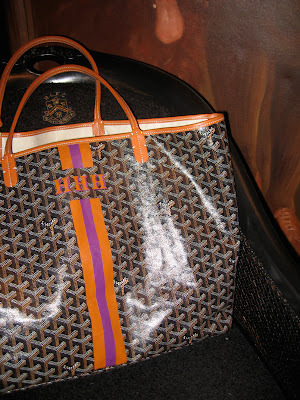 My customized Goyard tote finally returned from Paris. I expected the purple to be more of an eggplant, but love this lighter version just as much. Supposedly, the Goyard rep at Barney's liked the color combination so much that she's ordered the painted black with brown trim versions for the store with the same colors! Will report back when I see them on the shelves. Just note -- my stripes came first! may I know how much is it if you don't mind?